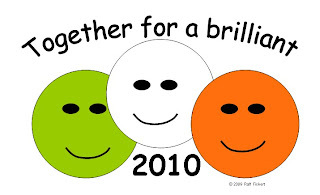 Q2 News: Together for a brilliant 2010! Together for a brilliant 2010! 2009 was a very hard and challenging year for most of us, facing unemployment either yourself or amongst your family and friends and on top of that, the devastating damage done by flooding. Most banks are not willing to support small businesses, refusing business loans or taking away overdrafts, which has resulted in a lot of small enterprises having to let loyal employees go or to close down completely – not to mention new start-ups.As if this was not enough, we are also facing swine-flu – which is causing a great deal of suffering for a lot of families. All of the above resulted in more and more people realizing the real value of family, friendships, relationships and neighbours. Even ‘being unemployed’ is no longer an “isolation factor” as anyone may face it in these challenging time or will be acquainted with at least one person who has lost his job. The positive effect of 2009 is that people have once again become important to eachother. Social and business networking is increasing dramatically and will deliver a solid base for 2010.Starting 2010 with a positive mindset as well as a great healthy network will finally help us to achieve a great 2010 together. We can change it together by focussing on the positive aspects and giving each other a helping hand.